Rise Up donates 100% of its net proceeds to the benefiting charities, but how are net proceeds calculated? Net proceeds is the sum of registration and donations, after deducting event production and marketing costs. All of the net proceeds are donated to the listed charities proportionally, based on the cause(s) selected per-registrant. Event production and marketing costs include social media ad campaigns, race shirts, bibs, medals, shipping charges, as well as permits and portable restrooms as required. All local event coordinators, and even the national director, are unpaid volunteers. Volunteerism allow us to cut event production costs and give all we can to our benefiting charities. What comes with my 5k or 1 Mile March registration? Each 5K and 1 Mile registrants receive a race packet, containing a tri-blend “Rise Up” shirt and a commemorative race bib. When will we receive additional details about race day and packet pickup? Registrants and volunteers will receive an email the first week of June containing the local event coordinator’s contact information, your city’s Rise Up 5K location, and the location and time of race packet pickup. Race packets are mailed directly to virtual registrants. Race packets for virtual registrations before August 15, will be mailed on August 20. Race packets for virtual registrations on or after August 15, will be mailed within ten business days of registration. On September 1, you can rise up and run with us anywhere! Options include coordinating a group run with other local registrants on the local event’s Facebook Page, or traveling to a Rise Up 5K event location near you. How can I volunteer for the Rise Up 5k? Anyone can volunteer, or even help coordinate a Rise Up 5K in their area. To volunteer, simply click on “Join Us,” select a city near you, and register to volunteer. If you would like to become an event coordinator or co-coordinator, please email AshleighTeeter@RiseUp5K.org. How can I spread awareness for the Rise Up 5k? What is a Rise Up Ambassador? When you register, you will receive a confirmation email containing your personal COUPON CODE to share with friends, family, and co-workers. Become a Rise Up Ambassador by recruiting registrants using email and social media. 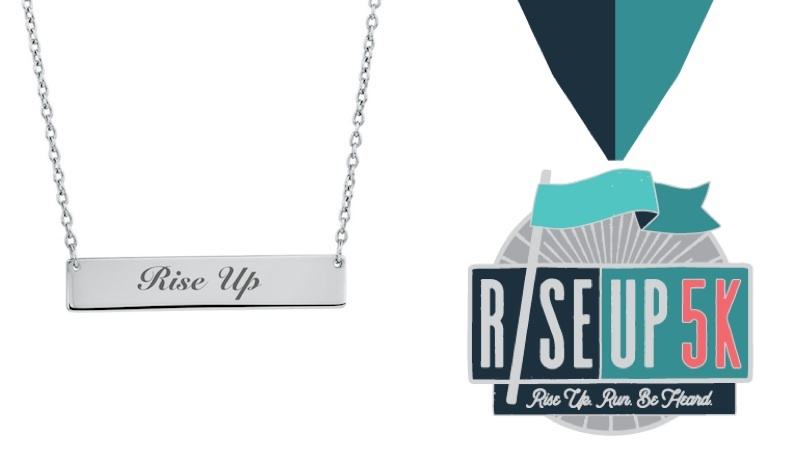 SILVER AMBASSADOR– If 10 OR MORE people register with your code, you will receive a commemorative Rise Up bar necklace. GOLD AMBASSADOR– If 25 OR MORE people register with your code, you will receive BOTH the Rise Up bar necklace and a commemorative Rise Up Ambassador medal. A movement is nothing without its members. Thank you for spreading the word about the Rise Up 5K. I can't make it to an established Rise Up event on September 1. How else can I support this event and its causes? You can register for the Rise Up 5K – National Virtual Run, or you can donate to one or more of the supported charities. Can I make an additional contribution to a specific charity as well? Yes! We encourage all participants in the Rise Up 5K to donate as much as they can to the charities of their choice. You can donate to one or more of the supported charities here. Who is producing the Rise Up 5k? The Rise Up 5K is produced by the Community Alliance Running Event Series, Inc., a 501(c)(3) non-profit organization which provides a co-production platform for empowering charities and schools with the ability to co-produce a consolidated running event benefiting multiple partner organizations. You can meet our team here. How can I contact the national co-directors? Please contact us here. We are very responsive, and will reply within one business day. Registration does not include a finisher medal for each participant. However, we award medals to the top five finishers at each local event. Rise Up 5K Ambassadors also receive medals based on the number of registrants referred to the event. What are the benefits of becoming a benefiting charity? The Rise Up 5K enacts change by donating 100% of our net proceeds to benefiting charities whose mission involves one of our five focus issues. This monetary support is our most-direct method of advancing our benefiting charities’ goals—but our support doesn’t end there. This year, we are giving our benefiting charities the opportunity to add their voice to our nationwide movement. National charities can recruit their chapters to produce local events. These local events are focal points across the country, where Rise Up participants gather to run, converse, and be heard together. Therefore, by co-producing these local events, our benefiting charities are given a valuable platform to spread their message. Will it be difficult for my local chapters to produce their own 5k? The Community Alliance Running Event Series, Inc.’s nationwide race-directing infrastructure makes hosting a 5K easier than ever before. We handle the administrative burdens that often dissuade organizations from hosting 5K’s, so your organization can focus on spreading your message. For each local event, we provide race registration software, create registration packets, sell merchandise, and purchase event permits, restrooms, and commemorative race medals. For first-time race directors, we offer detailed instructions about how to manage a local event in our Event Production Manual. In this way, the Rise Up 5K is a great opportunity for local organizations or chapters to learn how to host their own running events. What will my local chapters be responsible for? Your local chapters are only responsible for supplying volunteers. These volunteers will distribute race packets, setup and teardown the race course, direct racers during the event, and award medals to the top finishers. How can my organization's message be spread though the Rise Up 5k? The Rise Up 5K is a focal point of conversation. Rise Up participants are all deeply interested in making progress toward our five focus issues. This makes hosting a local Rise Up 5K an incredible opportunity for organizations or chapters to advance their mission by giving focus-issue-specific content to their target audience. Focus-issue-specific content may be (but is not limited to): advertising your organization’s cause, eliciting new membership, giving brief speeches during award ceremonies, and disseminating pamphlets. We encourage you to recruit your local chapters, and use the Rise Up 5K as a springboard for continued community engagement. Will my organization receive a larger donation for hosting local events? Indirectly, yes. Each Rise Up 5K registrant is given the freedom to direct their registration donation to the benefiting organization of their choice. By hosting a local event, you have the opportunity to publicize your organization to the local registrants who will participate in your event. Your community engagement improves the likelihood that local participant will direct their donation to your organization. My organization or chapter has never hosted a 5k. Will it be difficult? Have no fear—hosting a 5K will never be easier than with the support of the Rise Up 5K Co-Production team. We provide race registration software, create registration packets, sell merchandise, and purchase event permits, restrooms, and commemorative race medals. For first-time race directors, we can even teach you how to manage a local event with our Event Production Manual. In this way, the Rise Up 5K is an opportunity for local organizations or chapters to learn how to host their own running events. What are my organization or chapter's responsibilities? We primarily need our local chapters to supply volunteers. To become a nationwide movement, the Rise Up 5K needs community members across the country to distribute race packets, setup and teardown race courses, direct racers during the event, award medals to the top finishers. How will hosting a Rise Up 5K advance my organization or chapter's mission? The Rise Up 5K is a focal point of conversation. Rise Up participants are all deeply interested in making progress toward our five focus issues. This makes hosting a local event an incredible opportunity to advance your mission. You can advertising your organization’s goals, eliciting new membership, give brief speeches about your organization during the award ceremony, disseminate pamphlets, and more. We encourage you to make your Rise Up 5K a springboard for continued community engagement. Does my local organization or chapter receive a donation for hosting local events? Indirectly, yes. Each Rise Up 5K registrant is given the freedom to direct their registration donation to the benefiting organizations of their choice. By hosting a local event, you have the opportunity to publicize your organization to local registrants. Your community engagement improves the likelihood that local participants will direct their donation to your organization. The same process works for local chapters of nationwide organizations. Your community engagement improves the likelihood that local participants will direct their donation to your parent organization. Specific parent organizations may split donations with their chapter, but this is decided by the parent organization—not the Rise Up 5K.